In an effort to get The Baby Nickel to stop napping during rest time, I’ve taken to keeping him downstairs for his quiet time, in the only separate room (except for the bathroom) in our open downstairs. (When you see pictures of the kitchen/dining-living room, you are seeing the vast majority of our central living space.) But still, he falls asleep. This wouldn’t be a problem, except that then he is wired at bedtime, sometimes not going to sleep till 10 or even 10:30. I like my quiet, kid-free evenings, so this is a serious problem. I have to keep reminding myself that this, too, shall pass. Kids grow up, you know. It’s the funniest thing. 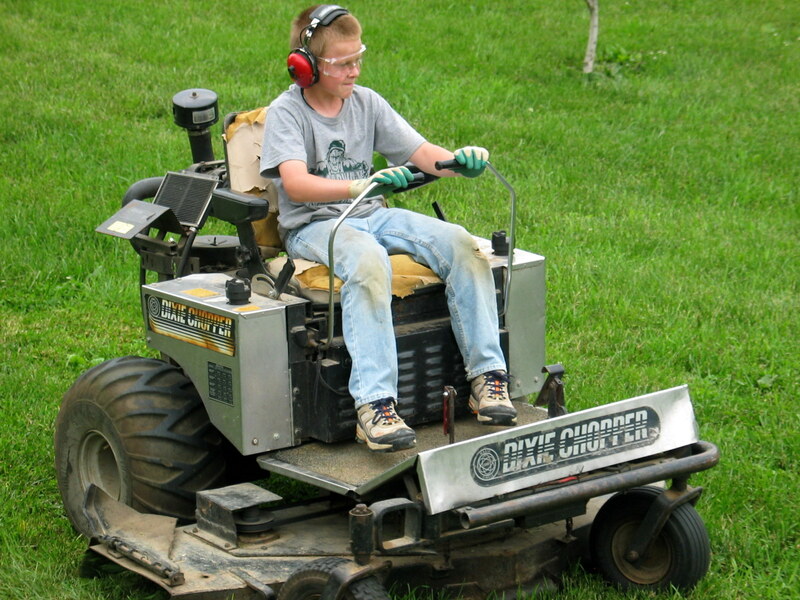 Yo-Yo used to wear diapers and now he mows our lawn. 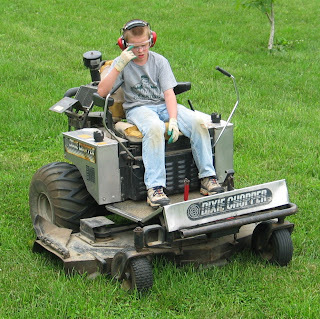 On the zero-turn mower. The kid loves the thing. 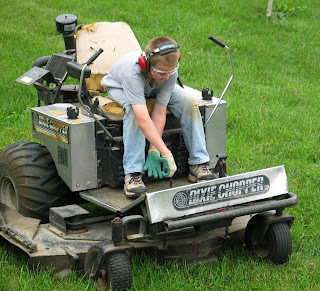 He begs to mow the lawn. Hey, Mom, come out here and look at this! See how high the grass is? It comes all the way to my ankle! Don’t you think it’s time for me to mow again? 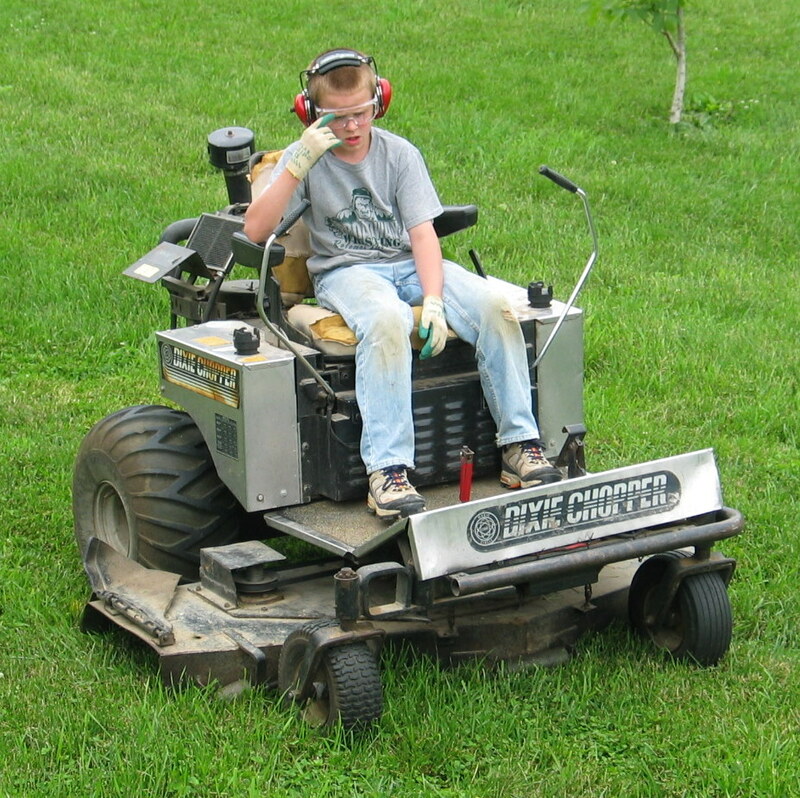 How about I call Papa and see if he’ll let me mow tonight? Huh? Huh? Can I? Can I call him? Huh? MOM! I NEED TO MOW THE LAWN NOW OR I’LL DIE! Okay, so he doesn’t actually say he’ll die, but that’s how he acts. And he's pretty convincing. The kid has a flair for the dramatic. Trust me on this one. He does a pretty decent job, too, with the mowing thang, now that he’s learned to aim the spraying grass away from the lettuces and spinach, to drive around the yard in a systematic pattern (not all loopy-like), to get closer to trees and shrubs without chopping them completely off (to be fair, that only happened once, I think). He’s such a little Mr. Handsome, what with his ear and eye protection, work gloves, and his calm manner and intense focus. The machine scares the crap out of me, it’s so touch-sensitive and fast, but he’s cool as a cucumber on it, zipping about like he knows exactly what he’s doing. Which I think he probably does. 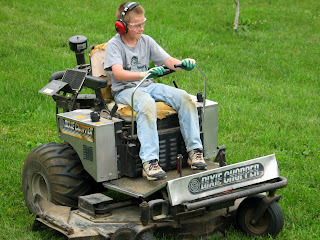 In a couple years he’ll be able to do the whole lawn, start to finish, including the weed-wacking. The kid ain’t in diapers no more, that’s for sure. My baby is often still up at 10:30, too. Wobbly head, droopy eyes, but refusing to sleep. What's with these kids? 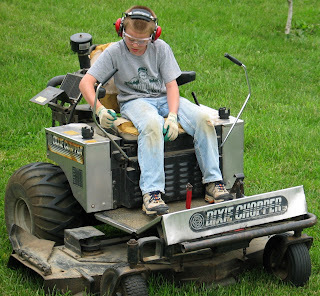 My husband has been working with a 11 or 12 year old kid at church who LOVES riding the zero turn mower--and it scares me too. Stuart can't get some of the other guys to ride it. And I well remember the days when my youngest took a long nap, then was going til 10 or 11. I got around the "this is mommy's quiet time" thing by letting her know she could stay up til she got tired, but she couldn't bother me. Usually it worked. She would sit in her corner of the living room reading or doing something quiet, and I would read or watch TV (that was g rated). Aw...they really do grow fast don't they? Came across your post and noticed all the PPE your son was wearing to mow the lawn - Hearing protection, eye protection, gloves, long pants, and boots. Great job! I'm hoping that in 2017, he's just as safety conscious.